CR is a Jesus-centered 12-step ministry structured to facilitate & celebrate Gods healing power in our lives. It is similar to Alcoholics Anonymous and other 12-step programs, but it is much more. Celebrate Recovery is for everyone, anyone with hurts, hang-ups or habits that get in the way of living an abundant life. It is not just for people with drug or alcohol issues, but everyone who has a broken area in their life. Do you ever eat or drink more calories than your body needs? Do you ever feel you ought to exercise but don't? Do you ever know the right thing to do but don't do it? Do you ever know something is wrong but do it anyway? At First Christian Church, we take these words seriously. We have learned that every single person - as a member of the human race - deals with a hurt, a hang-up, or a habit at some level, in some form. Some hurts, hang-ups or habits would be - abuse, adult child of alcoholic parents, anger, codependency, eating disorder, financial, food addiction, love & relationships, and sexual addiction. 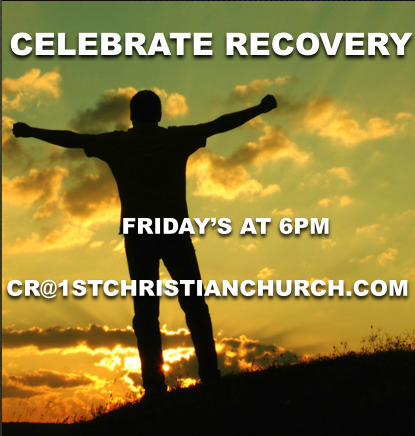 The Celebrate Recovery experience allows us to "be changed," and it allows us to be changed by Jesus. We open the door by sharing our experiences, strengths and hopes with one another. In addition, we become willing to accept God's grace in solving our problems. By working and applying Biblical principles, we begin to grow spiritually. We become free from our addictive, compulsive and dysfunctional behaviors. This freedom creates peace, serenity, joy and most importantly, a stronger personal relationship with God and others. As we progress through the program, we discover our personal, loving and forgiving Higher Power - Jesus Christ, the one and only true Higher Power. If you would like more information, please email cr@1stchristianchurch.com or call 770.832.3974.